WEST LAFAYETTE, Ind. — The Purdue men’s tennis team kept its unbeaten home record intact Saturday afternoon by taking down 61st-ranked Harvard 4-3 on the Basham Courts inside the Schwartz Tennis Center. 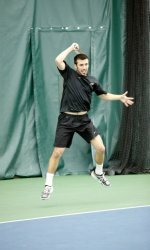 Branko Kuzmanovic earned the deciding point in Purdue's 4-3 victory Saturday. Harvard (4-3) pulled out to an early lead by winning the doubles point. Aba Omodele-Lucien and Christo Schultz picked up an 8-2 victory at No. 1 over senior P.J. Rose and sophomore Eric Ramos. The point was clinched at No. 2, where Alistair Felton and Andy Nguyen earned an 8-4 win over senior Slavko Bijelica and sophomore Thomas Wilson. Purdue (7-1) avoided the sweep as seniors Paul Foley and Branko Kuzmanovic, playing together as a doubles duo for the first time this season, defeated Alexei Chijoff-Evans and Joshua Tchan 8-5 at No. 3. Ramos pulled Purdue even as the match moved to singles. The Alameda, Calif., native improved to 7-1 this season in singles play when he defeated Schultz 6-4, 6-2 at No. 3. Bijelica nudged the Boilermakers ahead as he picked up a 6-2, 7-6 (5) win over Felton at No. 2. The Crimson tied the match again at No. 5, where Nguyen won 7-5, 6-3 over Foley, and jumped ahead for the final time when Chijoff-Evans earned a 7-6 (2), 6-4 win over Rose at No. 1. The final two matches needed three sets to determine a winner and stretched the match past the four-hour mark. Wilson battled back after dropping the first set to defeat Davis Mangham 4-6, 6-4, 6-3 and even the match one more time. Kuzmanovic, playing in just his second match this season after returning from an injury, clinched the victory for Purdue with his 7-5, 4-6, 6-4 defeat of Tchan, who was ahead 4-1 in the final set. Purdue earned its first victory over a ranked opponent this season and is now 1-1 against nationally-ranked foes. The Boilermakers have eclipsed last season’s overall win total and already have one more home win than last season’s team. Purdue returns to action Sunday when it hosts Illinois State at noon ET. Admission to the Schwartz Tennis Center is free, and live results can be found at purduesports.com.